Good Morning. I woke up to receive this notification in my inbox. Let's give these guys some business! Yesterday, September 11th, I learned of the new tobacco tax in Pennsylvania. In respect of the special date, I've held off on this announcement until today. The new law, passed by a Republican legislature and signed by a Democratic governor, is imposing a new $.55 per OUNCE tax on tobacco products. (Cigarettes have their own separate tax increase and cigars are exempt). This tax goes into effect on October 1 and includes any in-store stock I may have. So come October 1st, I need to inventory all my pipe tobacco and pay the tax on it. Obviously, the less stock, I have, the less tax I need to pay. So starting now until September 30, 2016, all pipe tobacco is discounted another 25%! Tins AND BULK! This is a huge discount on our already heavily discounted prices, but I'd rather pass the savings on to you, than pay the state. Only tobacco in stock is subject to the sale. Quantities are limited to what is in stock. NO SPECIAL ORDER items will be accepted, even if they appear on the web site. If it is not in stock, it is not available for this sale. After, September 30th.... truthfully, I'm not sure how we will proceed, but I expect us to still continue if at all possible. But for now, buy, buy, buy! You will never see these prices again! Remember: First notice of 'scarce' tobaccos is always posted on our FaceBook page first, so be sure to sign up. As always, I've listed some specials or new items below. Please feel free to look at them. Specials can sell out suddenly so order soon. Join us on Facebook as a fan of 'mars cigars & pipes'. Get updates on new arrivals and specials. See the quicklink on the right side of this email. LOt of things I buy are no longer in stock and if they are too small a quantity to bother with. Good luck to them. I missed out on Rotary, Capstan Blue, and Sav 140. They don't ship outside the US. By the way, I'm surprised to see that some of the biggest pipes/tobaccos sellers too aren't shipping outside the US. P&C to name one. So sad. If anyone knows anyone personally at mars cigars, would you mind slipping them a word ? "So come October 1st, I need to inventory all my pipe tobacco and pay the tax on it. Obviously, the less stock, I have, the less tax I need to pay." That part right there is so unfair to a business, especially small ones running on tight margins since the goverment wants the tax before you can collect it from the consumer. You think you've bought and paid for your inventory free and clear and now you need to pay more. I jumped on the opportunity. Not a big order, but I got the last 8 tins of Royal Yacht, and the last 3 tins of the C&D Christmas Blend and threw a tin of Pennington Gap in for good measure. Edit: Woops, the discount is already included in the price. No biggie... over $2 cheaper than other places with the discount. Still a smoking deal. The loose tobacco tax was the compromise for not banging premium cigars with huge taxes. Once again, pipe smokers are collateral damage. Everything decent seems to be out of stock. Their stock was definitely wider than deep but I managed to snag a few GLPs I needed as well as a few POUNDS of G&H that P&C too quickly sold out of during their last sale. "The power to tax involves the power to destroy"
I'm sure the extra tax will bring in a net negative after it drives the smaller B&Ms out of business and their contributions to other taxed areas is figured in. Can't collect business tax and licenses once you drive someone out of business. I managed to snag a few MacBaren and Captain Earle's blends. I was disappointed that the Pennsylvania legislature let this new tax on loose tobacco go through. I placed my first order very shortly after receiving the email this morning. I concentrated on the blends I knew would sell out quickly that my cellar needed. It was a large order. Just a few minutes ago I placed a second order that contains the other, 'less in demand', items and other blends not in danger of the grandfather ruling. To my astonishment, my second order number is nearly 130 above my first. So, that small operation is dealing with 150+ or so orders today. Must be busy! Yea, most things I would have gotten were out but I did fill out the Hermit-Captain Earles blends I wanted for the cellar. Let see since I live in PA and the new tax of .55 per ounce, I would owe $1803.40 in floor tax if I owned a B&M. Hit their site too late last night. Of the ten blends I smoke and cellar all were out of stock. My loss but I'm glad some of you made out well. I tried to order a few tins of Orlik Golden Sliced but they don't take Mastercard ! Or evidently Paypal ! Mike must really be swamped. I made my first order at 11:00 AM Monday. I guess there were many earlier. In an email exchange a few days ago, he told me it would be 4-5 days before he could send out my order. So yes, he is swamped. Anyone got their order yet? I placed mine at 8:30 right after opening the email monday morning. Haven't heard anything yet. I got mine on Saturday. I know two other people who did, too. I got an email update last night that my second order (smaller of the two) is shipped. I wasn't worried but I am anxious to get my orders! I wonder how many orders they ended up getting last week. Sure felt like a feeding frenzy. Nothing yet...maybe because I made 4 orders...also no update in my Mars account yet. I just got an email last night that my order shipped, I think I placed it last Monday. I'm sure they were swamped with orders. I got an order confirmation, but no shipping email. Does that mean my order hasn't shipped yet? I ordered last Monday evening. You will get a "Shipped" email. They are crazy busy with the flood of orders. Might not hurt to give them a call if you are concerned. Mike is a good guy. Now it seems as if there's only 25% OF all tobacco left...If that. I placed my order just after midnight on Sept. 13. On Sept 17, my credit card had not yet been processed and my order status had not changed. I sent in an email and they advised they were still working on the orders from Sept 12. As of just a few minutes ago (9:15am Sept 20), my order status still hasn't changed and on last look yesterday my card still hasn't been processed. They're either extremely short handed or have a ton of orders to process. Either way I'm just waiting patiently. Mike will get the orders out...The Face Book page says how swamped they are. He doesn't need any extra distractions, does he? Just checked and my order still shows as received. I have dealt with Mike and he is a straight up good guy. I will just wait patiently and no concern here. It's not like I am going to run short or anything. I got my order yesterday. I'm one day shipping from his location. I checked this a week ago, but too many blends are out of stock. The broken ecommerce system requires you to click on each one to see what is in stock. That's a bit much for those who are not obsessives. Just got my email and my order has shipped. Skraps, that's a beautiful Royal Yacht score. That picture is also now my desktop background. 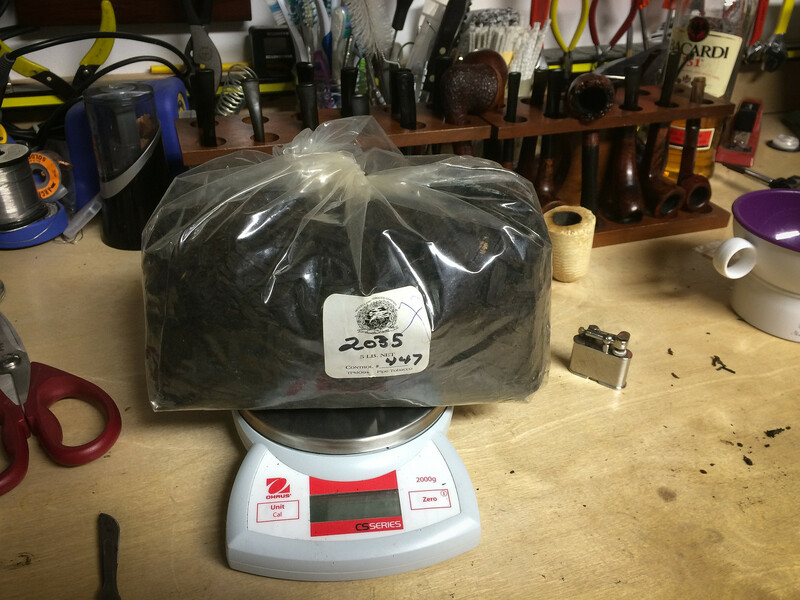 Here's my order that arrived a couple of days ago, 5# of McClelland 2035. I've jarred about half of it already. There's another order on the way with an assortment of GH ropes! Of course this happens somewhere from whom I cannot order. Ah well. Re: the MasterCard thing - I emailed Mike and he told me to check out using Money Order as payment method. Then send the money order and the order will ship when he gets it. Depending on how patient you are, you can still take advantage of the sale if you're like me and all of your credit cards and your check debit card happen to be MasterCards. I would suggest that you talk to your bank about getting a Visa debit card. Some banks can give you the choice of MC or Visa or both. If not, most banks can issue you a zero-fee credit card from the provider of your choice. To make matters even more dangerous, there are a lot of zero interest/21 month cards out there now. Well - I've never had an issue at all up to this point, and if I started procuring even more ways to spend money, I'll be typing further posts from either the hospital or the homeless shelter. Here's my order that arrived a couple of days ago, 5# of McClelland 2035. I've jarred about half of it already. Damn, I'm glad I was able to get my measly 8 ozs! Good stuff! Ok. I got my shipping notification last night. Weird since I placed the order right after getting the sale notification. All's well. You can all sleep easy now. Got a small order placed...16oz of McClelland 2015 and a couple tins of Dan. My order arrived yesterday. I placed a second order a few days ago, so that should be shipping off in the next day or two. First order was 6 SG blends I haven't tried except one, and the second order was 5 100g tins of MacBaren HH Latakia Flake.